Bridge Day is an annual one-day festival in Fayetteville, Fayette County, West Virginia, United States. The event is coordinated by the New River Gorge Bridge Day Commission, and is sponsored by numerous companies of both local and international significance. The event, held on the third Saturday every October, commemorates the 1977 completion of the New River Gorge Bridge. On this day, all four lanes of the bridge are closed to automobiles and opened to pedestrians. Estimates have 100,000 people attending the overall event. The first Bridge Day was held in 1980 and drew a crowd of roughly 40,000. It has been held every year since except for 2001. It was canceled that year due to the recent events of 9/11 and the possibility of terrorist attacks. 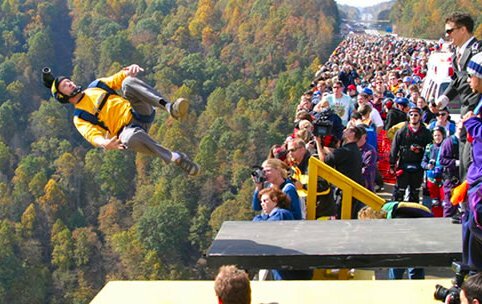 Bridge Day is the only day of the year people are allowed to BASE jump, off the bridge into the New River Gorge 876 feet (267 meters) below, one of the few exceptions to a general ban on BASE jumping within the U.S. National Park System. People are also allowed to rappel from the span on Bridge Day. About four hundred BASE jumpers participate in each year's festival. In 2015 the BASE jumping community boycotted the event. There have been three deaths during Bridge Day due to accidents involving BASE jumpers. Rappelling off the bottom of the bridge has been part of the Bridge Day festivities since 1981. The first bungee jumper leapt from the bridge during the 1992 Bridge Day. More bungee jumpers leapt during the 1993 Bridge Day; however, injuries sustained during a mass bungee jump that year prompted the banning of bungee jumping at Bridge Day.